If there's one word to describe how I felt when sporting this outfit it would be 'Ranch-Cowgirl'-due to the hat and plaits combination. It also probably didn't help that my sister was singing country western songs whilst taking these photos-thanks sis. 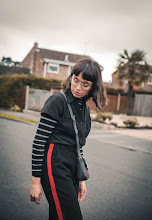 Western aside with my recent go-to a.k.a black turtle neck jumper (can't get enough!) in tow I decided to take inspiration from my Hello Kitty backpack (obviously) by pairing it with a similar coloured pleated skirt, I recently inherited. There's something about wearing a full pleated skirt that I adore, from the retro influence to the way it flows whilst you walk-cue the dramatic entrances. What could once be seen as a "granny" piece of clothing, can soon be banished with the help of an oversized faux-fur coat and a Hello Kitty pack back (of course).